Today I woke up, I read my advent reading, I thought about what the kids would wear for the Christmas Eve service, and then my nose started running, and my throat more than tingled...it ached. By the time Austin left it started getting that old familiar feeling. My perfect Christmas Eve was obliterated by sickness. I would love to tell you I took it all in stride and that I found I had not set any mommy expectations, but that would not be at all true. Although I thought I had not set any high standards or tiny idols to worship on this day...apparently I did and it looked like a routine day followed by dressing spiffy, going to church, participating in a family story time with our church, followed by candle light songs, then coming home to eat Tullos family gumbo with our friend-family. It was going to be so perfect. So much love. So much sharing. So much worship. So perfect. Instead let me give you the shake down of the day. Our (amazing, glorious, wonderful) babysitter came over to watch the kids and brought along a coffee for me to take with me to my doctor appointment. At my doctor appointment I (barely, barely) tested positive for strep which started a really super fun conversation about the possibility of needing my tonsils removed since this is the FIFTH time I've had strep since June. I laughed it off while in the office, made a big ole family appointment for the 26th to test for an A-symptomatic carrier in the group, and then promptly walked to my car (parked facing the massive windows of the office), shut the car door, and unashamedly BAWLED my eyes out. I then replied to Austin's text with one simple word: strep. My sweet friend Hannah called me and already had the news since our hubses (what's the plural of hubs?) work together. Her first words "GIRL, NO!" and then started round two of my tears. She asked for my Panera soup order and made arrangements to load up her little bitties and bring me soup at lunch time. Then I came home to happy kids and our sweet sitter saying that her parents had offered to host the kids at their house for awhile so I could nap and rest. Cue tears round 3. (no judging sickness has dark magic with which is makes me cry + Christmas so yea I cried to our sitter a little ok?) 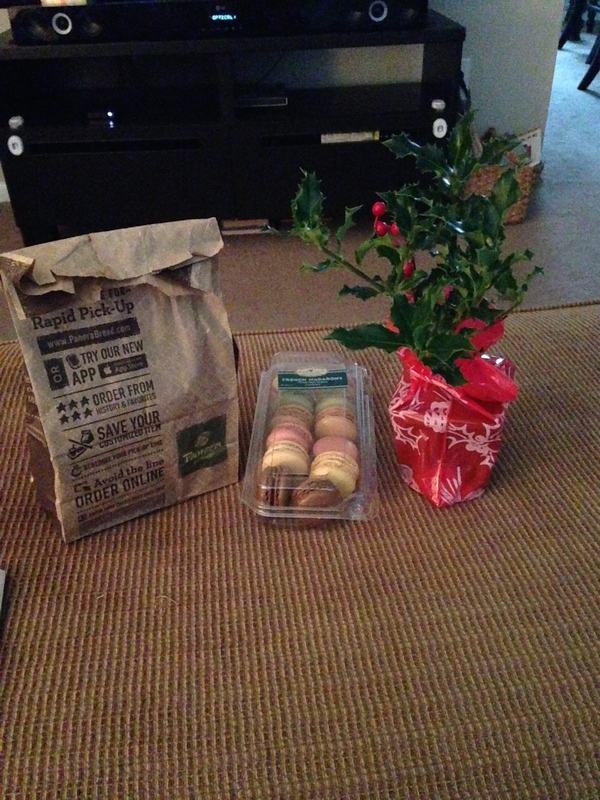 After dropping the kids off and picking up my prescription I was greeted in my driveway by Hannah who had two kinds of soup, french macarons, and a small holly plant to cheer me up. I ate. I watched more Gilmore Girls (Oh did I forget? I watched about 15 hours of GG two days ago when I was suddenly hit with a 24 hr stomach bug), and I slept. After that I picked up my happy children who, thanks to this beautiful family, were loved and played with instead of tolerated and put in front of a TV by their sick momma. We came home, they napped and I rested. Then I reached out to Hannah to ask if we could configure a FaceTime scenario so I could see the service, which we affectionately named "Silent Stealthy Night." I clothes-pinned a black shirt over my camera, muted my microphone, and she covered her screen with a black sock and ponytail holder. I got to watch the entire service. My kids sporadically woke up and joined me. There were plenty of tears from our 4 year old, he was so excited to read about Jesus to our church from the stage. But we powered through. Then our church all light their candles to sing The First Noel and Silent Night. I decided that we could do at least this in our kitchen. So I turned off all the lights and light the first candle I found, which turned out to be a Target dollar spot candle. The kids were so amazed and tried really hard to sing along (The First Noel is so much more wordy than I remember!) and they loved every moment. They were beaming with golden glows and quiet smiles. And cue tears round 4. In that moment it dawned on me. There is no way that Mary expected to birth God's son in a barn. She must have patted her tummy one hundred times and whispered "Just stay in there baby Jesus," while they made their unavoidable trek. But instead he came at the worst time a pregnant woman could possibly imagine. I'm sure it wasn't how she pictured it that first day the angel spoke to her. I'm sure she pictured something perfect. But what she ended up with turned out to be such a greater story didn't it? A king born in a dirty barn, what a PERFECT picture of the Holy Savior coming down to the darkness of the world. And suddenly sitting around our junky and battered ikea table with the dollar-spot candle glowing, I couldn't imagine a better way to anticipate and celebrate Christ's birth. Because it was awful. But it was perfect. In this day there was so much love. So much sharing. So much worship. So perfect. Strep throat is a terrible terrible thing to have on Christmas Eve, but because of it...so much joy and so much love was experienced by my family. A far greater surprise than I could have ever dreamed.